The pressure was on for his first show. At 11 pm EST on September 28, 2015, millions tuned in to Comedy Central to see South African comedian Trevor Noah take the helm of The Daily Show. Since the announcement that Noah would be taking over the award-winning show from Jon Stewart, spectators had been wondering what the fate of the show would be. The announcement of Noah’s selection as the new anchor of The Daily Show was quickly met with confusion and concern about the choice, made worse by a scandal that erupted around Noah’s offensive Tweets from several years ago. For months people speculated about whether the new show would have a more ‘global’ or ‘international’ feel given the host’s origins. Trevor Noah needed to prove that he could follow Jon Stewart’s legendary 16-year run, and counter all of the various criticisms and concerns voiced by the media and, more importantly, viewers of the show. In less than 2½ minutes, Noah actually did something pretty masterful. One of the key principles of effective communication is that when you want people to think, feel, know or do something, you need to meet them where they are. It is not merely enough to do or say what you want to say, or what you might find persuasive. Rather, you need to know how your audience thinks, feels, knows, or does, and meet them there in order to persuade or inspire them. Whether it is a CEO speaking to shareholders, a religious leader speaking to the community, an activist speaking to donors, a teacher speaking to students, or a comedian taking over an anchor desk—this principle of meeting people where they are is vital to achieving success. This is what Noah did in the opening of his first show. And he ended his message by speaking directly to The Daily Show viewer, his primary audience, with a message of thanks and a promise of continuity in this new manifestation of The Daily Show. “Thank you for joining us,” he said, “as we continue the War on Bulls**t.” He ended his message by pledging to continue the work Jon himself encouraged people to continue in his final show: the War on Bulls**t.
And the rest of the show continued on in true Daily Show form, while also continuing to address and satirize some of the speculation about Noah. “I just keep hearing ‘global’!” said the seemingly nervous Daily Show correspondent Jordan Klepper halfway through the show. In 2½ minutes Trevor Noah connected with the audience, soliciting laughter and applause, and assuaged fears of what the show would become after Jon Stewart left. And he delivered it in true Daily Show comedic style. And the reviews reflected this. 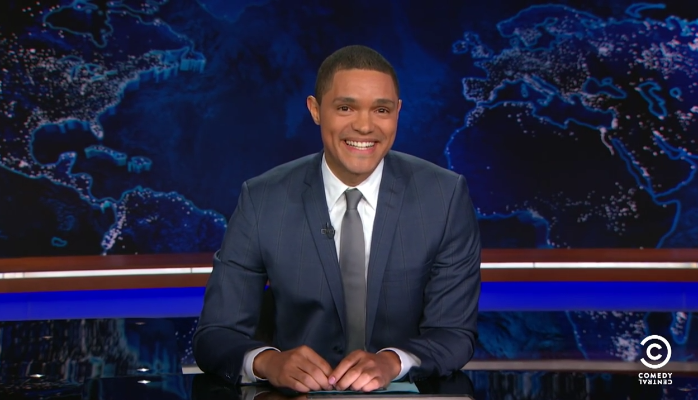 Though reviews of Noah’s overall performance were mixed, one thing was clear —The Daily Show with Trevor Noah was still The Daily Show. And that was specifically what Noah and The Daily Show team were trying to prove. No one can simply come in and fill the job of an award winning comedic icon in the first 22 minutes on air. It will be a while before Trevor Noah will be declared a success or failure. But he did accomplish something in those first few minutes — he met people where they were. And that, in large part, is what has had The Daily Show viewers come back for more the next night.